James Hall, Food Services Director; Steve Hyde, CEO PRMC and Erin Barnes, Director of Marketing to Jenny Wilson, United Way of Lamar County Executive Director. The Paris Regional Medical Center Team raised more than $38,000.00 as part of its 2018 United Way Campaign, which is $10,000.00 more than 2017 donations. Team Members pledged donations, but, in the spirit of keeping it creative, hosted other events including a pumpkin decorating contest to help raise funds. 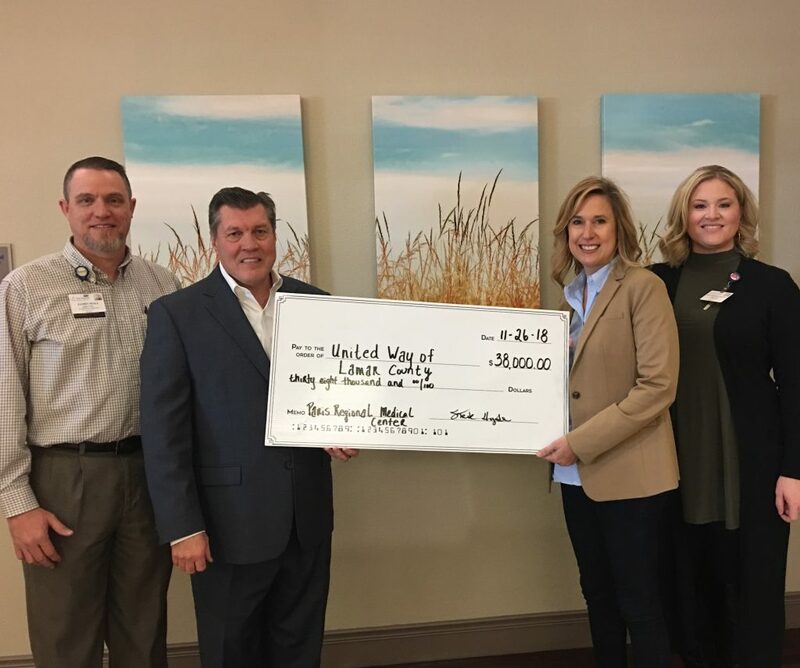 The official check was presented on behalf of all PRMC donators by James Hall, Food Services Director; Steve Hyde, CEO PRMC and Erin Barnes, Director of Marketing to Jenny Wilson, United Way of Lamar County Executive Director. The donations were part of an overall goal to raise $40,000.00 among healthcare organizations in Lamar County.